Lilya Kas'yanova, one of Kyrgyzstan's finest guides, is passionate about the history, art and craft of her country. She regularly contributes articles to this website. A graduate in Linguistics and Intercultural Communications from I. Arabaev Kyrgyz State University, she is also a keen photographer and hiker. 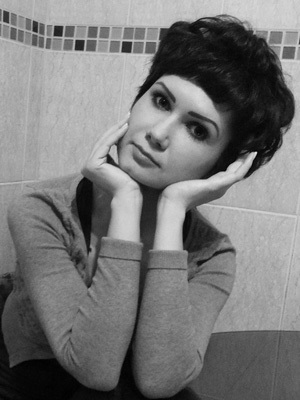 Let me introduce you to a remarkably talented artisan Erkebu Djumagulova, who lives in Bishkek, Kyrgyzstan. She is the leader of a jewel-box workshop that produces felt dolls and felt accessories The workshop, which includes a team of eight handicraft workers, snuggles within a former Soviet industrial estate. 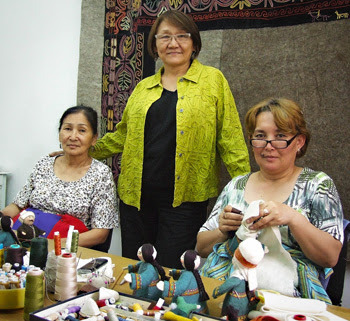 This is a story of a success-oriented, assiduous self-made woman, who has devoted her life to the research, revival, support and development of authentic Kyrgyz applied arts and handicrafts. A graduate of Frunze Arts College, Erkebu eje majored in textiles, fabric painting, weaving production practices and felt making technologies. In 1975, as the result of a postgraduate work assignment, Erkebu eje started work with Kiyal, the National Association of Folk Artistic Crafts. During her three years with Kiyal, she focused on textile ornaments design, master pattern creation and textile printing. Then, the young specialist transferred to the scientific-research laboratory arm of Kiyal. There, she was involved in a new project aimed at researching traditional culture and folk crafts. This included a challenging two-month expedition to the Naryn and Osh provinces of the Kyrgyz Republic. Accompanying the expedition were distinguished figures in art history such as E. K. Sorokin and A. Akmataliev. Careful surveys and systematic studies of saima (embroidery) shyrdaks (mosaic thick felt carpets), ala-kiyiz (motley felt carpets) resulted in the creation of one-of-a-kind art, drawing and sample book. It is a mine of information on handicraft processes and the interpretation of patterns and colours. When her maternity leave was over, Erkebu eje left Kiyal, and embarked upon a career as a freelance artisan. That period was followed by bitter trials and hardships caused by the break-up of the Soviet Union; it was a time when Erkebu eje, like many others, was battling to survive. She designed and produced a number of embroidered wall hangings of high artistic merit, some of which were purchased by the Museum of Fine Arts in Bishkek and exhibited there. Other pieces are now found in private collections. These creative activities helped her to overcome many difficulties and challenges, keep her feet firmly on the ground, and motivated her to set up her own business. In 2005, GIZ, the German development company, entered into an agreement with representatives of the “Ainur” electronic industry enterprise to lease a unit of its factory for five years as part of a business incubator project. Thus, Erkebu eje‘s workshop moved to new premises: ten years on, she and her close-knit team are still there. 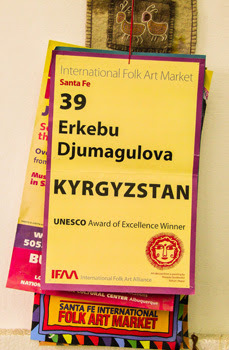 Over the past eleven years, Erkebu eje has participated seven times in the International Folk Art Marketin Santa Fe, in the United States. Her first time there triggered a “second wind” and greatly enhanced the subsequent development of her small enterprise. Erkebu eje’s work has garnered many awards. Among them, she was awarded the 2005 UNESCO Crafts Prize for an outstanding contribution to creativity in the making of felt dolls. In 2007 she was awarded the Seal of Excellence for Handicrafts, Central Asian Region for her “Summer” decorative felt cushions. 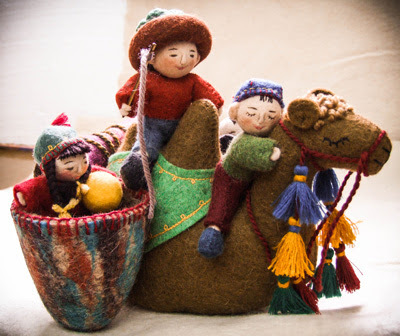 In 2012 two further UNESCO awards were bestowed: Awards of Excellence for Handicrafts, Central Asian Region for “Happy Childhood” felt toy and “Heirs” felt toys composition. Now Erkebu eje is engaged in creating new styles, processing orders, quality control and the procurement of dyes, threads, glass beads, and felt in particular, as it is the basic material for doll making. Felt is stocked up in advance for the upcoming winter season. (There are sayings in Kyrgyz culture such as “Repair your cart in December; in July your sledge remember” or “Make provision for a rainy day but in good time”). Erkebu eje’s outstanding team consists of eight permanent staff at the workshop and a fluctuating number of “outworkers”, depending on the number of orders. Her younger sister is in charge of accountancy and executing customers’ orders in due time. The family business also involves Erkebu eje’s niece, who manages the workflow of the staff who work at home, such as felt cutters.Her daughter, a music master, deals with foreign clients. The staff classified as “outworkers” are craftswomen and mothers of large families; some of the outworkers are talented graduates of art colleges. They specialise in making clothes for felt dolls, accessories, and a variety of decorations, as well as assembling cute, little felt animals. A mother and her two sons supply round, elongated work pieces (blanks) to be used as heads, bodies, hands and legs of felt dolls. All parts of the prospective dolls are assembled within the workshop as this intricate and delicate process has to be supervised by the chief artisan – Erkebu Djumagulova. 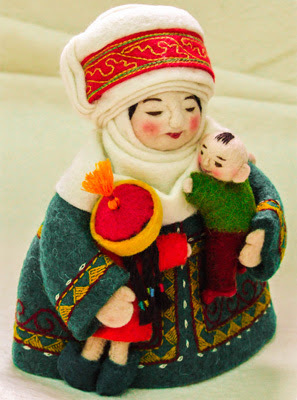 One more significant and complicated stage of doll making has to be mentioned here: the creation of doll faces - distinctive, easily recognizable Kyrgyz features (cheerful, sweet, kindled with happiness). Two talented mistresses of needlework carry out this process. Erkebu notes: “The making of dolls’ faces is a prerogative of a very limited number of craftswomen; this skill is exceptional”. This is one-of-a-kind enterprise, managed by a brilliant and creative artisan and businesswoman, which embraces her family members, friends, industry peers and individuals. It makes an indispensable contribution to the region’s economy, ensures cultural sustainability, and helps to revive and keep the rich and flamboyant practices of felt making alive. I would like to wish Erkebu eje continued success and prosperity in her all future endeavors! Note: A visit to Erkebueje’s workshop is included in an Uzbek Journeys tour.